When it became clear that the structured links of the proto-wiki site design were becoming too difficult to manage, the project was moved to a very powerful wiki platform. After substantial development, it proved that the chosen platform was a tremendous resource hog and was going to max out server space and boost user bandwidth usage. So the replacement site was pulled down and the slightly creaky HTML site put back up in its stead. S-stay tuned for further developments. Tun-tuned. 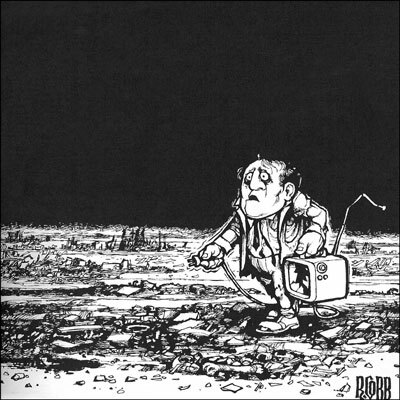 I had always wondered if this Ron Cobb cartoon from the early 1970s (a favorite of mine since I first saw it) was an influence on any of the Max Headroom creative team. Cobb worked on the art teams of many Hollywood sf and fantasy productions from 1981 to 2000 or so, so it's not an impossibility... and recently I got word from George Stone that a framed print hung over his desk well before and into the Max era. Readers browsing the site will find a number of references to "the MaxRchives" and it was just brought to my attention that the corresponding explanation hasn't yet found its way here. I mess with the page layouts, styles and display components a lot, and the MediaWiki platform sometimes behaves unpredictably when I do. While I am going for a weird, Max-influenced vibe, I do aim for a clean, clear, intuitive interface as the higher priority. Frequently view-checked under Windows Firefox, Android Chrome and Android AdBlock Browser. Regularly view-checked under Windows Chrome, Windows Edge and Windows Safari. Please let me know of any peculiarities or display quirks on any browser or platform. Thanks. This page was last modified on 9 December 2015, at 13:33.